Mouse CD3 epsilon, Fc Tag (CDE-M5256) is expressed from human 293 cells (HEK293). It contains AA Asp 23 - Asp 108 (Accession # P22646). 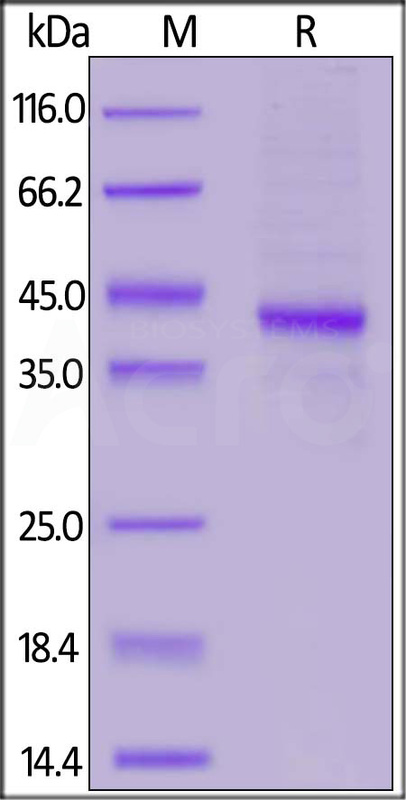 The protein has a calculated MW of 36 kDa. The protein migrates as 45 kDa under reducing (R) condition (SDS-PAGE). Mouse CD3 epsilon, Fc Tag on SDS-PAGE under reducing (R) condition. The gel was stained overnight with Coomassie Blue. The purity of the protein is greater than 95%. T-cell surface glycoprotein CD3 delta & CD3 gamma chain, also known as CD3D & CD3G or CD3D&CD3G respectively, are single-pass type I membrane proteins. CD3D, together with CD3- epsilon(CD3E) , CD3-gamma and CD3-zeta, and the T-cell receptor alpha/beta and gamma/delta heterodimers, forms the T cell receptor-CD3 complex. T cell receptor-CD3 complex plays an important role in coupling antigen recognition to several intracellular signal-transduction pathways. (1) Gold DP, et al., 1986, Nature 321 (6068): 431–4. (2) Clevers HC, et al., 1988, Proc. Natl. Acad. Sci. U.S.A. 85 (21): 8156–60. (3) de Saint Basile G, et al., 2004, J. Clin. Invest. 114 (10): 1512–7. (4) Wong S, et al., 1991, Clin. Exp. Immunol. 83 (1): 69–73.